Now That I'm Already A Mom, Gets Ko Na! Now That I’m Already A Mom, Gets Ko Na! 5. Feet that fit into my palms. I’ve always wondered why there were plenty of photos of baby’s feet. When Raviv was born, my Victory small groupmate Li’Anne visited me. 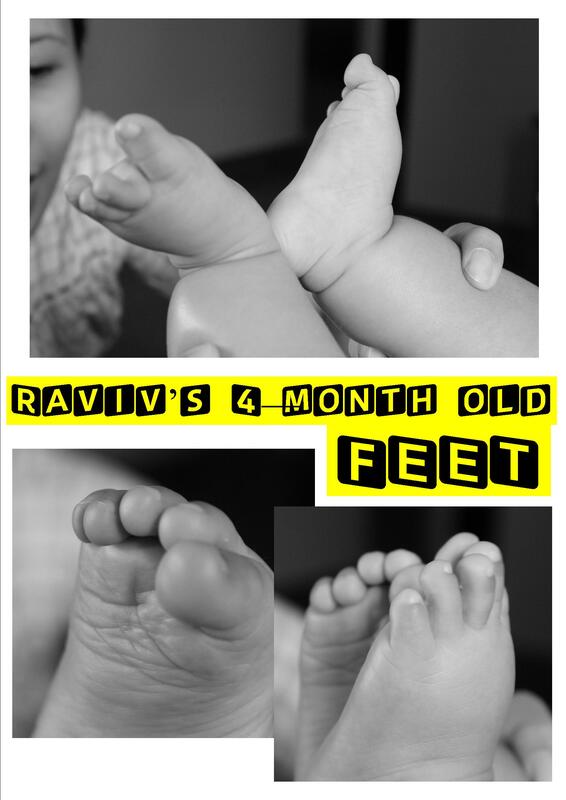 She immediately requested me to remove Raviv’s booties so she can take a look at Raviv’s feet. 4. Simple sickness that makes mommies scared. I used to wonder why moms are so OA when their babies get even just simple sniffles. But when Raviv got his first colds, he kept on tossing and turning and crying. First realization: sick babies = sleepless moms. Thus the scare. And then the panic that he can’t breathe, but appeased by a quick Google search. And then finally, feeling sorry that helpless little Raviv is not comfortable. I imagine him having pains and discomfort that he can’t specifically communicate! Just the thought makes my heart crumble. I know that having sniffles is not life threatening, but as a Mom, I want my baby to be always happy—not because of sleepless nights, but just because I am Raviv’s Mom. ‘Nuff said. 3. The “Wag po, maawa po kayo, may mga anak po ako“ line. Every time I watch movies or TV shows where a character is about to be murdered, this is always the line. I used to think that it was stupid, because, what does the murderer care about your children? Sa ‘yo nga na nakikita niya in person wala siyang compassion, paano pa sa mga anak mong abstract ideas lang sa kanya? But now I get it: Once you become a parent, even at gunpoint, self-preservation is only secondary. It’s no longer “I want to live longer so don’t kill me”, but rather, “What will happen to my children if I die?” Before becoming a Mom, I was more carefree and less worried. And as someone who accepted Jesus Christ as her Lord and Savior, I know I’ll be in a better place. But what scares me so much is the fact that my son will miss being smothered and loved and disciplined by his Mom who loves him so so much (I’m tearing up as I type this). My husband will take care of him of course, but I want to be there to plan his birthday parties, make sure he’s eating right, kiss his boo-boos, give him tips in courting girls, and spank him (or paluhurin sa munggo) when he’s being naughty. I HAVE TO BE THERE to make sure he doesn’t do drugs, become an Oblation scholar (haha, yeah right, ambisyosa ako, pero BLOG KO ‘TO! ), become a servant of God, and yes, even a chance to temporarily hate me. 2. That becoming a full-time wife/mom isn’t a stupid move but rather a very admirable move. Full-time wives/moms, now’s the time to hate me, because I used to think that you were stupid, wasting your degrees just so you could change diapers, cook a mediocre adobo or make sure the bathroom doesn’t stink. I mean, what are helpers for, duh?!? In fact, I thought you were going for the easy way out, because you’re just not cut for the world where great minds meet. Now I take all of these back. I realized this when I met Dr. Wen Del Rosario-Raymundo. Dr. Raymundo is a loyal BRAIN TRAIN client. When her brilliant son Juancho made it to the Philippine Science High School (PSHS) Main Campus, she messaged the BRAIN TRAIN Facebook account and conveyed her heartfelt gratitude. When her Juancho ranked #2 out of 1000+ examinees in UP Rural High School, she gave every BRAIN TRAIN teacher and staff a present. Even Raviv got presents (with an “s”; I was pregnant with Raviv when her son was reviewing). I got curious about her, so I Googled her and stalked her Facebook account. I learned that she is also a PSHS Main alumna, an OB Gyne, and belonged to the first batch of UP INTARMED (UP’s accelerated medicine curriculum that shortens studying medicine by two years). That means she’s one of the chosen few: only 20 boys and 20 girls per batch may be qualified for UP INTARMED. Brilliant, eh? I finally got to meet her a month ago, when she enrolled her youngest child for BRAIN TRAIN’s summer enrichment classes. I asked her the hospitals she’s affiliated with, and she told me that she has stopped practicing years ago to be a hands-on mom. My jaw almost dropped, and I couldn’t help but admire her. That brilliance, the years of training to be a doctor…? Then it dawned on me: Giving up a successful career isn’t stupid but admirable! Being a mom is a lot more difficult than being a “career woman” or even “career executive”. My job is mostly mentally exhausting, but being a mom to an active, inquisitive Raviv is equally mentally, emotionally, and physically exhausting. As a career woman, you have an excuse to always look great, buy new outfits, get mani-pedis (“Kelangan presentable ako!“), and even attend sosyalans (“Working cocktails yun!” or “Networking technique itong pagpapa-spa ko para maging close ako sa possible client”). Girls, let’s admit it: our careers make us sane! Above wanting to get that paycheck, we also work because we want a social life. 1. Why Janice Can’t Bring Herself to Kill “Angelica”. People my age can relate! The popular tagline, “Ang anak ni Janice” is from the movie Tiyanak. To those who haven’t seen it yet, it’s about a childless woman (played by Janice de Belen) who adopted an abandoned baby, who, unbeknownst to her, was actually a tiyanak. She called this baby/tiyanak Angelica. I remember being so irritated at Janice’s character, because the tiyanak could have been easily killed if only Janice had not interfered several times. She also refused to believe that her Angelica was a tiyanak. And when she finally saw that Angelica was a tiyanak, she was set to kill her. But, I vividly remember this scene, when the tiyanak was in flames and transformed into a crying Angelica, Janice (or was it Lotlot De Leon’s character?) had to be restrained as she wanted to still save “Angelica”. As a kid, I remember wanting to shout to her, “Ang t@ng@ mo, alam mo na ngang nagpapanggap lang ‘yan eh!” I was so irritated at Janice’s (or Lotlot’s) character, until I had my Raviv. I keep on thinking that if Raviv were a tiyanak, I still couldn’t kill him or leave him in a blaze. No, not in a million years. Janice, I now understand you. Mam! Pinatawa mo ko sa title (Gets ko na! ), pinaiyak mo ko sa #2 tas tinakot mo ko sa #1. Hahaha. Hi Ernee! Hahaha! Thanks ha. Ü We miss you! Hi Dew! Thanks so much for sharing your post.Sobrang natawa na naman ako.you told the ‘truths’ in such a funny way. Honestly,when i was younger,i met people who i knew ‘belittled’ my being a housewife and full time mom and i got affected deep inside though i never admitted it. Through the years though,i have learned to appreciate my choice and in fact,i feel privileged that i have a choice of working or not working.My heart goes out to moms who are so exhausted and stressed already and want to quit their jobs but simply can’t.I have 5 really kind(they all talk politely even to the help,maawain sa poor) and sweet(they come to my room just to hug and kiss me.even my teen age boys still do and are so expressive enough to say that they are so lucky na ako ang mom nila) children and i think they wouldn’t have turned out this way had i left them with the yayas all these years. Thanks Joy! Ako naman, I’m glad I’m able to still supervise Raviv while working…aakyat lang ako, hehe. That’s what I love about our work. When I hear Raviv cry, I would race to where he is. He is also often brought to our office by his nannies. Pero kung iba siguro ang set-up, ang hirap no? Miss na miss ko. Bravo! Love your post! 🙂 Iba na talaga pag nanay ka na! Hi Lyrara! Thank you very much! Motherhood has turned me 180 degrees! Hi Ms. Dew. Alam mo, pareho tayo ng reaction nung nameet ko si Mommy Wen. Actually minsan ko lang siya nameet and di ko siya kilala personally, pero nakikita ko siya kasi yung pamangkin ko kaschoolmate yung mga anak niya nung preschool sa Montessori Children’s House. At saka minsan siya yung nagspeech sa program. Hanga kami kasi mabait siya at very humble, mahal siya ng mga bata sa school kahit yung mga yayang nagbabantay doon, tapos nalaman naming duktor pala siya pero di niya binabanggit. Mommy Wen kasi ang tawag sa kanya doon ng lahat ng bata, pati teacher at parents. Yung pamangkin ko HS na hanggang ngayon Mommy Wen pa rin ang tawag sa kanya. Tapos nalaman namin na professor na pala siya noon sa PGH pero nagresign sya, tapos nung nagkakids di na siya nagwork. Yung kids niya hindi nag-yaya, laki sa kanya. Pagnameet mo sila, behave at mababait lahat, at saka good manners. Pag sinasabing sayang naman ang pagkaduktor nya, ngingiti lang daw sya at sasabihing walang sayang pag pamilya ang inuna. Sana pag nagkaanak ako, makuha ko rin mag-give up ng career at maghands-on na magulang. Hi Ms. Grazelle! Agree with you! Dra. Wen is so humble! She’s always gentle and smiling whenever she talks to us–I’ve never heard her talk arrogantly or in a maarte or even pasosyal way! When she calls us, she refers to herself as Mommy Wen nga, not even Dr. Raymundo just to intimidate our staff. All the more I appreciate her as we’ve experienced several parents na sugod at galit lang agad without even knowing what really happened, or kahit mali ang anak doon kumakampi at lahat na ng palusot idadahilan lumabas lang na hindi anak nila ang dapat sisihin. We’ve already had two Raymundo boys as students, and both of them were really good boys. ‘Pag absent, talagang nag-a-attend ng make-up classes, unlike yung iba reklamo pa nang reklamo eh kung tutuusin we just want to give them their money’s worth. With her children’s attitude and laurels, I’m sure Mommy Wen has no regrets. I’m actually looking forward to meeting the Raymundo unica hija this June. By the way, how did you stumble upon my blog? Thanks for the comment! Being a full-time mother is one of the highest salaried jobs since the payment is pure love. Friendship, salamat! Ü miss u. Sayang wala akong turo sa Lucena this summer. Hi Dane! So sorry for the late reply. I also hope to meet you soon! It has been a while since the last time I made a comment and now here I am again. Hahaha! I so love this post. I am a stay at home mom. 2 girls who are in their teens and a 7 year old girl. With all the things you listed I have to agree. For us parents mas important talaga ang health and safety ng mga kids natin. I may have “not used” my college diploma for working outside of the house but on the other hand, I am able to help my kids when it comes to their homeworks and all. Advance happy Mother’s Day to you! Raviv is one lucky boy to have you as a mom. Awww! I salute stay at home moms talaga, especially those who could have had good jobs! Advance Happy Mother’s Day, Grech!! !